This doesn't sound like Xwayland related, so the component should probably be Weston, no? What does "does not handle tty switches" mean? Does it just not allow switching VTs at all after weston is up? Correct, it should have been Weston, I don't know how xwayland got selected. To reproduce: give the user or group permissions to the framebuffer device with chmod, or setfacl. 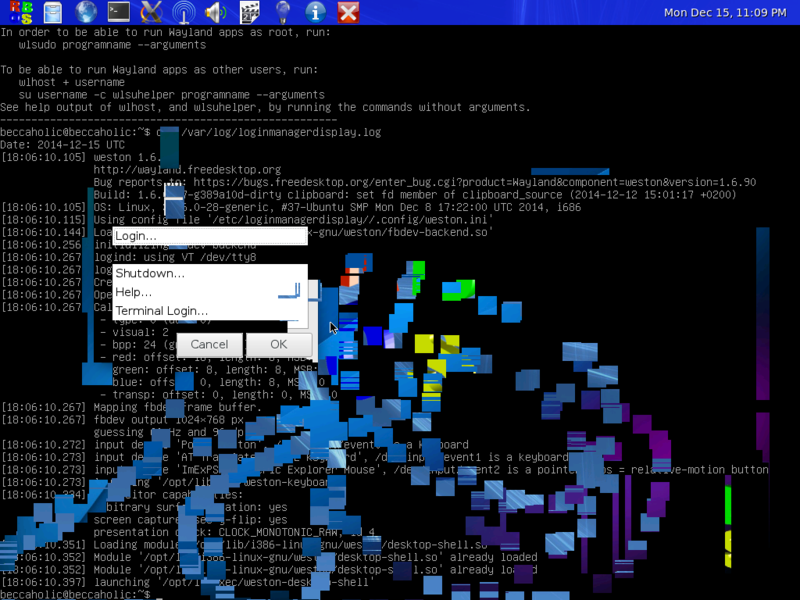 Login with the user account onto a text mode TTY session. Switch to another text mode TTY, and start typing. Not only will the application get that text input, but the drawing of the window starts appearing on the TTY as well. You can also move the mouse, and that will appear on the second TTY as well. This does not seem to be fixed with systemd v216 as I thought might have been caused by https://www.libreoffice.org/bugzilla/show_bug.cgi?id=81932 in logind v215, it does seem to be a bug in Weston itself. I was suggested to try to see if I see "Deactivating session" getting logged by weston when switching VTs when using the fbdev-backend. It does not get logged. I tried using pixman on drm-backend to try to isolate, as asked on IRC, and I still see "Deactivating Session" in the scrollback, as well as on drm-backend with the default renderer. Sorry, I just realized that the "Deactivating session" string is for the DRM backend, and the fbdev-backend prints "leaving VT" on TTY switching. To clarify, when not using weston-launch, I don't see "leaving VT" as well on fbdev-backend called sessions with logind. However I do not see any of these lines get output. Hi. I was able to actually create a patch that fixes this. I admit I made the subject line too long by mistake. could you check if the new series of 4 patches might fix this bug for you? I am able to tty switch nicely with these patches. we do DRM-device synchronisation, otherwise we don't.